Reproduced below are the words of Tony Blair, responding to claims that British society is in morale decline (copied from an article in The Guardian). The big cause is the group of alienated, disaffected youth who are outside the social mainstream and who live in a culture at odds with any canons of proper behaviour. And here’s where I simply don’t agree with much of the commentary. In my experience they are an absolutely specific problem that requires a deeply specific solution. The left says they’re victims of social deprivation, the right says they need to take personal responsibility for their actions; both just miss the point. A conventional social programme won’t help them; neither – on its own – will tougher penalties. The key is to understand that they aren’t symptomatic of society at large. Failure to get this leads to a completely muddle-headed analysis of what has gone wrong. Britain as a whole is not in the grip of some general ‘moral decline’. This is a hard thing to say, and I am of course aware that this too is generalisation. But the truth is that many of these people are from families that are profoundly dysfunctional, operating on completely different terms from the rest of society, either middle class or poor. This is a phenomenon of the late 20th century. You find it in virtually every developed nation. Breaking it down isn’t about general policy or traditional programmes of investment or treatment. The agenda that came out of this was conceived in my last years of office, but it had to be attempted against a constant backdrop of opposition, left and right, on civil liberty grounds and on the basis we were ‘stigmatising’ young people. After I’d left, the agenda lost momentum. But the papers and the work are all there. 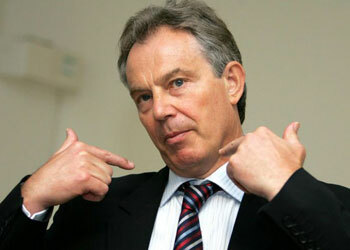 Wasn’t Tony Blair our elected Prime Minister in the late 20th Century? It was his job to do something about it, rather than glorifying chav culture like it was an amusing joke. These “alienated disaffected youth … living in a culture at odds with any canons of proper behaviour” are his creation. They have grown up in a culture of state funded hand-outs that rewarded teenage pregnancies and self-inflicted unemployment with free houses and benefits. Who should we blame for the work-shy feral youths that roam the streets like they own them, spreading lawlessness and intimidation in their wake? Who was the catalyst for the Jeremy Kyle generation? Who nurtured these profoundly dysfunctional families? Look in the mirror Blair! This entry was posted in Chav, General, Politics, Rant and tagged Blair, chav, PM, riots, Tony Blair by djh. Bookmark the permalink.